As "The Love Song of J. Alfred Prufrock" by T.S. Eliot is arguably the best known of his shorter works, it should not come as a surprise that there are many sources available where this is written about, derived from, or referred to. Being as that you have all ready read the poem, what you now need to find in the library resources are works that assist you in analyzing the work and Eliot's intent in order to make your argument. That is what this page is for. There are many places to look, some more easily navigated than others, and a wide variety in quality of scholarship. Let's find the best with the least amount of work! You can find useful chapters in scholarly books that critque this work from a variety of aspects. You will find yourself digging through irrelevant and unscholarly material to get the 'good stuff'. provides a more focused result, but not many sources. What about searching for criticism of Eliot? Specifically his poetry, or analysis of his work. "Prufrock" was not written in a vaccum, it was one of many works produced and many scholars have written on Eliot. Try a subject search on Eliot. T. S and look for criticism as a sub-heading. There are several ways to access articles through the Library and the thorough researcher will explore them all to find the best and most relevant resources for their paper. The following are listed from the not so useful to the most useful. 1) The Discovery Search is the default search tool on the library home page. This searches almost everything CSUSM has and because of that, I do not recommend it as a place to start because you will have too much that is not relevant to sort through. 2) Articles+ searches most of our full text databases. Note the "almost" as there are collections it does not search due to software incompatibillity. Again, not where I recommend to start, but it is better than Discovery. Literature Criticism Online is collected from the entire span of intellectual thought. In this source, you will find criticism contemporary to Eliot through material published in the past few years. There are other databases as well such as JSTOR, but MLA is really the place to start and will generally point you to those other databases, so start with MLA and the tricks on the next tab. Have your search strategies mapped out for authors, keywords and subjects, this will help your search go faster and return better results. If you attended a library resource presentation, look at the Course Guides page for your class to find specific helps that the librarian mentioned in your class. Note what types of resources you need at the very minimum. How many books, how many articles? Are there restrictions on the type of material to be located (must be scholarly, cannot be more than X number of years old...). Following these requirements will save you grief later. Use the Keyword field to start. Use this to more easily search various terms. BE CAREFUL! The Author and Title options are NOT where you type your author or work's title. These fields are for the author or title of the research you are looking for. As you haven't found 'the' article yet, you don't have the information needed for these fields. Source refers to the journal or book the research was published in and again, you don't have that information yet. You can search by descriptors or subject headings (which frequently duplicate the Library of Congress subject headings you see in the library catalog.) Typing the name of 'your' author in LAST NAME, FIRST NAME order is one possible subject heading. You will now have a results set. This is a list that will tell you what is available, but MLA will not give you the full text. YOu will use the GET IT Button and this icon will link you to the full text if available in other databases provided by CSUSM. The link is not successful on searching book chapters, so double check the catalog by the book title. Before harvesting from this list, learn to read the citations to understand what type of material you are finding. 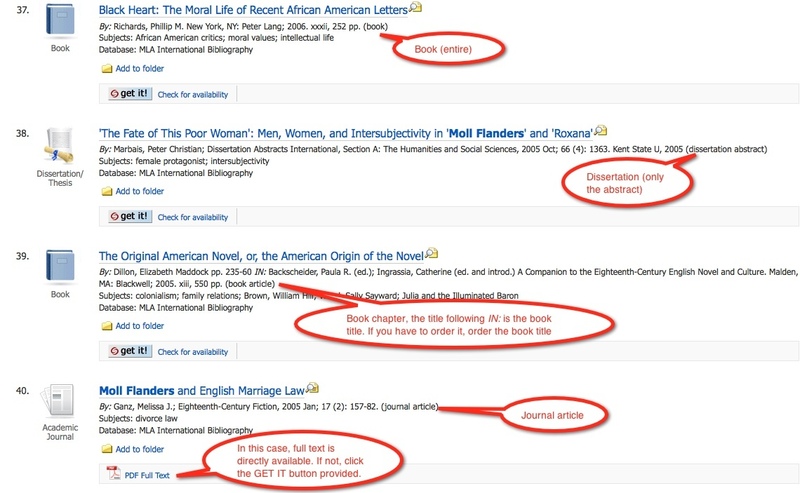 MLA indexes a variety of materials (articles, books, book chapters, dissertations and proceedings), this affects how you locate and access the material. --Title of the entry (whether article, book, book chapter, etc.) is the hyperlinked line. Click here to see more information on the entry. --Author is the person(s) who wrote the article, not the subject of your study. --Source notes the title of the journal or book that this entry is from. --Volume, year of publication, and pages within the source are given and needed for any citation or loan request. Books, book chapters and dissertations will also have publisher listed with place of publication. --Book Article denotes a chapter in a larger work. You would search the CSUSM catalog for the BOOK title, not chapter title.